Now that everyone has probably forgotten all about my glorious trip (yes I am gloating), I'm going to bring it back up. I promised some more stories from Colorado so here's part 2. Recall that our first stop was at the Taylor River and while we caught fish, things were not quite as good as last year. Last year there was one river we didn't get to fish. I was quite disappointed because the Gunnison is probably one of my favorites. This made up for last year and then some. Our first day on the Gunnison consisted largely of moving and setting up camp, but in the evening we got in a few hours of fishing. We made our way downriver from the campground as the shadows crept up the towering canyon walls. When we started fishing, it took a little time to get things figured out, but it was worth the effort. We were camping at East Portal which is as far upriver as you can go in the Black Canyon National Park and the only place in the park where you can drive to the river. 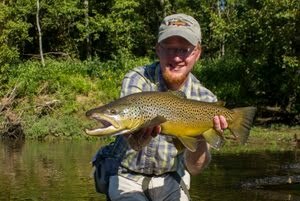 The fishing here is generally considered technical with small midge patterns accounting for a lot of the success. As you go downriver, hopper/dropper rigs begin to work better. 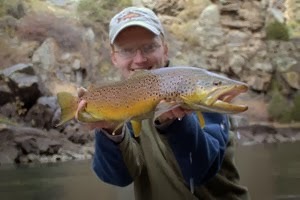 The river has a large biomass which supports one of the designated Gold Medal waters in the state of Colorado. 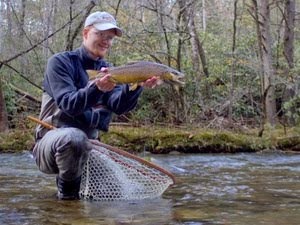 Rainbows and browns grow quickly and average an honest 16-17" at least in the East Portal area. 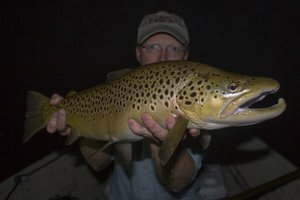 Finding the fish is easy since the large fish often feed high in the water column and in the riffles in only 18-24" of water. Figuring out what they are eating can be a little more tricky. 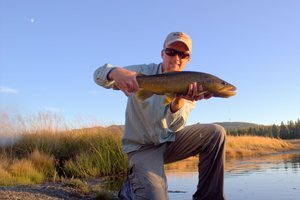 I started out fishing a Copper John that has produced well on the Gunnison in years past. The fish didn't seem particularly impressed though and I started thinking about trying something else. Fate decided to intervene on our behalf and my fly snagged the bottom of the river bringing up a large clump of weeds. Instead of throwing the mess away in disgust, I did a quick bug check in the mass of green. Our problem became obvious since there were a ton of tiny midge larva throughout the weeds and not much else. A hurried check of the fly boxes turned up some of east Tennessee guide Hugh Hartsell's blackfly larva pattern in black and brown. With just a little surgery to cut off the poly yarn sticking off the front, I soon had a decent larva pattern and was into fish right away. Several fish later in just a matter of a few minutes had us both convinced that we didn't have nearly enough larva patterns. Sweet, looking forward to the third installment.